Just a somewhat quickie post. I am starting to make myself get up at better times (I can go to bed before midnight and not wake up til 2:30pm the next day.. And that is giving you the earliest time I could wake up at). I am starting to actually be more beneficial to my body after surgery. Finally I am starting to get through my head all the changes that have already happened and will happen. Craziness. I am starting to snap out of my funk! Woo! Plus it has just been over a month now.. Time flies when you're not having fun as well!! Side note.. The other night, my bro had some of his pals over.. They were drinking and wanted to snap some photos of, well, anyways.. They borrowed my camera. Now, my camera isn't high quality, but I didn't want to get a new camera til around Christmas time as that would be my gift to myself.. I may have to invest earlier than I thought. It doesn't focus like it used to.. You have to take the photo and cross your fingers that it isn't too blurry. Plus it makes weird noises when you try to get it to focus. My brother says I am just trying to blame that on him.. But he does have a history of wrecking cameras.. Who knows what happened.. I just know that ever since he 'borrowed' it, it hasn't been the same. Prepare for sucky photos!! 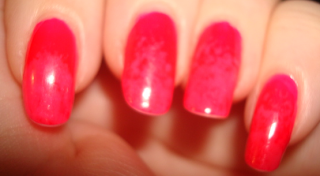 Ok, so, what you're looking at is CC Warhol with Island Girl Hawaii: Pink sponged on top. Actually, Warhol reminds me of the Claire's mood polish I have.. I might have to do a comparison between the two. 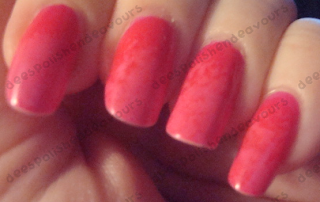 The two pinks don't look very different in either photo, but the top one is supposed to sort of show how they differ. IRL you can tell, honest! And now to toss in a photo of Bennie because.. 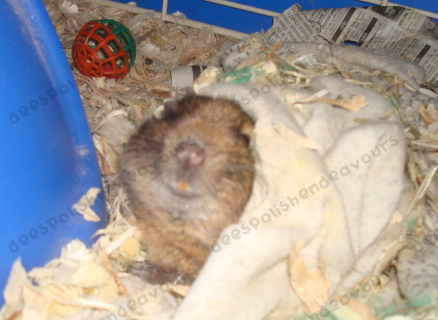 I went to check on him the other day.. And he had wrapped himself in his blanket.. Plus he is smiling.. Makes me chuckle! Tierney - Thank you very much! Glad you like them. Ditto on the feel better soon front.. I feel like I should do a count down!! ABOP - Thankies! I do too - to feeling better and about the mani! shortnails - oooohhh! You've given me a new place to check out! I will get on that as soon as I am done with this post!! I will also check out that tag-age, I am trying to be better about those things! UGH! I know.. I had actually been bid-warring on ebay for Bad Romance, but of course it was a ship to US only. If I ever find a way to get them here, I am getting you Across the Universe!! You're a gem!! Tessa - Will do! I love new blogs to follow!! Thank you for checking mine out!! Bernie is soooooo freaking cute!!!! Love the colour combo and the look!